I still have a million things to catch up on that are backlogged from my little mini-vacation. Would you believe that I am still planning to force a super late Christmas recap coming soon? But for today, I thought I’d go with the spirit of all things New Year and talk a bit about health and fitness. My attitude toward exercise, health, and fitness and general has changed a lot over the past few years. What used to be a high priority and something I truly loved, just simply fell to the backburner for a while. I had a hard time getting back into it after Cullen was born (for a number of reasons). The void of fitness talk here in this space has directly reflected the role that fitness has recently played in my life – not much! 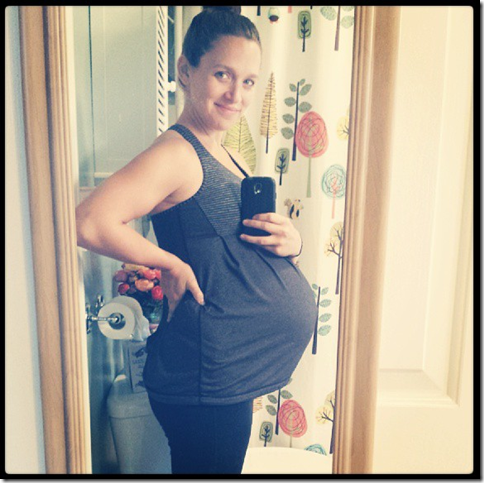 During my second pregnancy, I ran for the first 20 or so weeks until it became uncomfortable and I felt too sluggish. I did prenatal yoga here and there, but it was hard to schedule around Casey’s availability to watch Cullen. The one thing I did do consistently was Barre3. I started barre classes way back in November 2012 and have loved them ever since. I went 2-3 times a week during most of my pregnancy, and took my last class when I was 38 weeks along! I’m proud that I lasted as long as I did, and that I continued to modify workouts and push myself for almost the duration of my pregnancy. Since Graham was born twelve weeks ago (whaaaat? ), I haven’t really done much other than the obvious circus that is trying to juggle two kids. At my postpartum appointment a month ago, my midwife asked me how exercise was going and I realized I hadn’t actually done any. Oops! The following week my in-laws were in town, and there was a perfect sunny opportunity for me to change that. With willing babysitters and two happy kids, I laced up my sneakers and went for my first postpartum run. Casey went with me and we ended up covering just under four miles. I took a number of walking breaks, but I felt pretty good all things considered. I felt much less jiggley inside than I did when I first started running after Cullen was born, and overall I just felt more comfortable. Of course, two hours later I could barely move and felt like I’d run a marathon. Every muscle and joint in my body ached, and I was humbled by how far I’d fallen. But really, what can I expect? Have to start somewhere! As timing would have it, I got an offer code for a discount on Seattle’s Rock N Roll Half Marathon – a race I ran two years ago after Cullen was born! – and before I knew what had happened I was registered. Yikes! I haven’t run since and I have absolutely no plan, but I also feel like I still have some time to get all of that together. Graham is still just a little bit too small to run with directly in the stroller right now (and he is a major car seat screamer, so the attachment is useless! ), but I’m hoping he and I can get out there together soon. I’m also feeling very, very tempted by today’s Name Your LinkAmazon Deal of the Day – Name Your Link40%off BOB strollers, including the Duallie! So far I have resisted but seriously – SUCH a good deal. For now, my plan is to start casually running in the next few weeks and then come up with a more formal training plan. I’m not going to take any of it too seriously though, since I’ve already been down that road before, and I know the logistics and realities of running with two kids. I mentioned in my last post that I’m working on getting some regular childcare now, which will hopefully provide some time for me to get out there more regularly. And in doing that, I’ll be able to double up on another one of my 2014 resolutions – getting more activity for the dogs! I’m looking forward to leashing up my two favorite running buddies and hopefully giving them some physical and social stimulation. It is a million times easier to go running with two dogs than it is with two kids – it’s all about perspective, right? 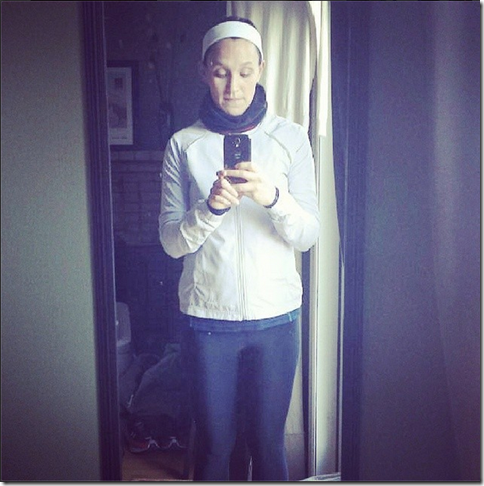 Outside of slowly easing back into running, I’m also jumping back into barre! Cullen played at a friend’s house this morning while Graham and I headed to our first postpartum class at Barre3 (they have childcare!). He was a rock star who didn’t cry a single tear (seriously – world’s easiest baby! 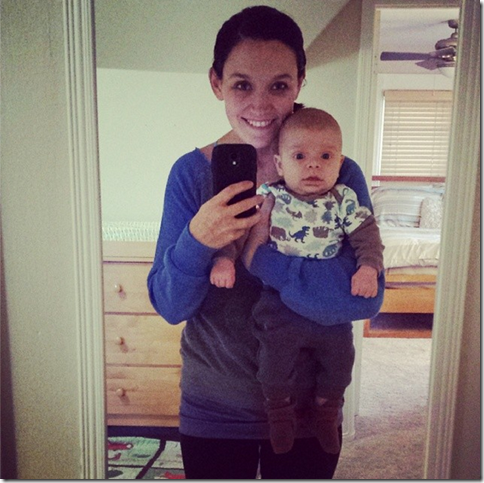 ), and I was a nervous mess who you would have never believed was a second-time mom. I spent sixty long minutes shaking, sweating, pulsing, bobbing, and craning my neck to listen for baby screams. It was brutal! I realized while I was there that other than for the two months after I first started classes, I have been pregnant for the rest of them! It felt good to not need to modify anything and to be able to lay on my back and stomach with ease. I’m working at least one class regularly into my weekday schedule, and am hoping to add another 6am class once I get Graham on a more consistent sleep schedule (stop laughing). I am already feeling sore! So for now, my basic fitness “plan” if you can call it that – is 1-2 barre classes per week, three runs a week either on my own or with the pups, and long daily dog walks whenever possible. It’s definitely a lot more complicated this time around since there are two kids (and schedules/needs) to coordinate. But in some ways it is easier because I’ve been through it before, and I already know what works, what doesn’t, and hopefully how to set myself up realistically for success. As for me physically? I’m down within a few pounds of my pre-pregnancy weight, entirely thanks to breastfeeding and toddler/carseat lifting. I’m not really concerned about weight though as I know it’s so arbitrary. My actual figure is still definitely carrying some extra curves, and while I would expect that to be the case, I’m also ready to start seeing some progress toward being more toned and fit. I’d like my old clothes to fit a bit better, and more than anything I’d just like to get a bit of my old confidence back. The good news is that despite feeling like I am stretched thin on time and energy, I’m also feeling a big surge of motivation. Maybe it’s the new year, maybe it’s the new baby – whatever it is I’m happy to be feeling excited about working out and getting back into shape. It is definitely time to start moving again! Next Post » Christmas 2013 (No, Really!). I’ve been missing it these last few months since my focus has turned to yoga instead due to health reasons. I took my last barre classes in November while on a work trip and I’ll continue to seek them out when I travel. For now though, the yoga seems to be helping. I’m so glad your plan includes time with the pups! Gotta keep those (older) joints active! I think you look amazing and I really admire how often you’re running! I’ve been doing Pure Barre since June 2013 and I really love what it has done for my body and mind, but I’m in a bit of a rut with running since I’m struggling with some lung/breathing problems which are really frustrating. Hopefully this year will be different! I was just glad to hear you mention your dogs. After your last post, I was pretty worried about them. Don’t quit your commitment to staying fit. It is so hard to get back into it the longer you wait. Emily, thank you so much for this post. It was very timely as I JUST finished reading about postpartum weight loss. I am 6 weeks postpartum with my first baby, and though I’ve been getting back into exercise with delight, I was feeling discouraged about my body. Unrealistic expectations I think! Loved to hear your perspective. Go get ’em! Six weeks?! Congrats and definitely give yourself a break. Even at 12 weeks I’m not expecting too much. Babies take 9 months to grow and the process of getting “back” to whatever is definitely slow. Not sure if you’ve ever check out anothermotherrunner.com, but they have a great perspective on the mom/running/life balance – and they always make me laugh! Nice post…really conveys the buzz of motivation you feel to take on 2014! after Cullen was born, we talked about the High Sierra Walk-a-Belt which allows you to walk dogs hands free. I would highly recommend it again! Choose the heavy duty model for your big boys! So worth it to have such easy control over two dogs. I will check it out again! Thanks! LOVE our Bob! DO IT! Good luck to you! I’m sure you’ll do great. This post is so perfect. Thank you for writing and sharing. I’m 40 weeks as of yesterday and desperately miss running (just wasn’t an option during this pregnancy!). In my mind, I thought I’ll be able to leave our little guy with his daddy & start running late February. It helps to see that I might be a little too optimistic, and that it’s okay to get used to mamahood, let my body heal, and ease back into things. It also helps to know that maybe I’m not the only one out there who’s thinking about signing up for a half marathon post baby this year! (But maybe I’ll give myself until September?!) Anyway, thanks for sharing. Perfect timing! I haven’t gone to the gym yet with childcare, but I would be the same way… heart pounding thinking/wondering if he’s crying! Running well into 20 weeks is so impressive! Great to see that you stayed active throughout your entire pregnancy and listened to your body. Where did you did that pregnancy workout top? I am currently preggers with our 2nd and well into my second trimester, my t-shirts and my husbands aren’t going to last much longer. Since I am an avid crossfitter I would like to find something that covers the bump and that top is super cute. Pingback: Daily Garnish » Blog Archive » Weekly Wrap Up.